(22 November 2011 – Hong Kong) Ocean Park is set to be the most exciting and heartwarming destination this holiday season, with Ocean Park Christmas Sensation offering a range of festive presentations and the launch of the much-anticipated Thrill Mountain theme zone. Adding to the exhilaration are over 60 innovative cuisines and over 150 types of themed merchandise. Long admired for its focus on creativity and innovation, Ocean Park this year has become the first to introduce DIY Christmas Cakes, and created a number of Christmas set meals for festive celebrations. Complementing the excitement offered by the rides in Thrill Mountain, the Park is adding a number of spicy snacks to exhilarate taste buds and double the thrill for guests. 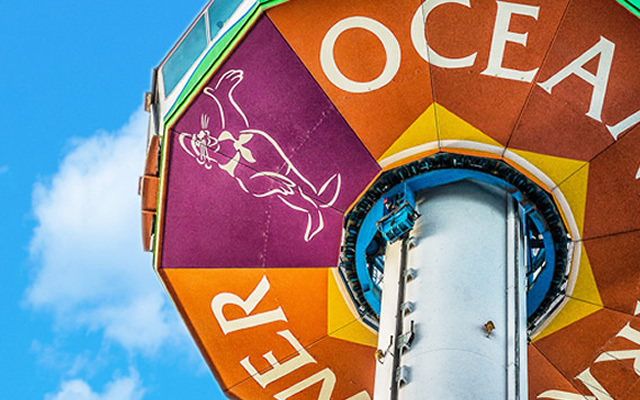 Those scratching their heads for the perfect holiday gifts would also do well to visit Ocean Park for practical and well-designed new themed merchandise. This year’s Ocean Park Christmas Sensation is introducing, for the first time ever, DIY Christmas Cakes. Guests will learn how to add different chocolate pieces on a white cream cake to create a panda or a snowman design to their own artistic taste#. Also, both kids and adults will be tickled by Whiskers Gingerbread, Panda Gingerbread and seasonal Yule Log Cake on offer. During Ocean Park Christmas Sensations, guests not only can enjoy a number of Christmas menus, they can also visit Neptune’s Restaurant for a 3-course Christmas set. The feast starts with Deep-fried Scallops with Mango Salad or Cream of Pumpkin with Sweet Corn as appertiser; followed by Roasted Tom Turkey with Honey Glazed Bone Ham, or Roast Tom Turkey with Grilled Beef Tenderloin as the main course; and Chestnut Mille-Feuille as dessert. Ocean Park’s various restaurants will also offer specially designed Christmas Kids Menu, with Sausage and Mixed Fruit Salad, and Corn on the Cob with Honey to start; and Turkey with Spaghetti in Tomato Sauce as the main course. Chocolate Puff with Chestnut Cream and a Christmas gift will bring the kid’s meal to a doubly sweat finish. To complement the launch of Thrill Mountain, Ocean Park is specially introducing snacks with exciting flavours, including Indian Spicy Roast Chicken with Naan Bread and Wasabi Pork Cutlet Ciabatta, for a thrilling culinary experience. Indian chef Rawat Beersigh has created a range of new Indian cuisines and curry dishes so that guests can enjoy stimulating snacks in between challenging themselves to the exciting new rides in Thrill Mountain. With Christmas just around the corner, Ocean Park has introduced a variety of more than 150 types of themed merchandise for Christmas Sensations, including scarves and gloves featuring lovable kinkajou and giant panda characters, making them extra heartwarming and some of the most sought-after gifts this holiday season. New merchandise for Thrill Mountain are all themed after carnivals, the circus and street performances, featuring ice-cream, cotton candy and clown designs. Many of the items include Ocean Park’s popular mascots in festive costumes and performing circus acts. Other items, such as t-shirts, sweat shirts and jackets, are themed after festive masquerade parties. Panda clown plush toys and carousel crystal balls are not only extra adorable, but also finely crafted. Guests can also choose among different styles of key chains, mobile phone lanyards, and fridge magnets. Thrill Mountain features five action-packed rides: Hair Raiser, Hong Kong’s first and only floorless roller coaster; Whirly Bird, a ride that allows passengers to control their own vintage plane; Rev Booster, a rhythmic and rollicking ride; Bumper Blasters, a bumper car ride loved by adults and youngsters alike; and The Flash, an exciting pendulum ride that launched last year. Guests planning to visit Ocean Park during the holiday season can also look forward to a wonderful variety of presentations that are part of this year’s Ocean Park Christmas Sensation, which runs from 1 December 2011 to 2 January 2012. These include: theLight Twinkle Twinkle Christmas Light Show, a brand new Christmas spectacular on Aqua City’s Lagoon; a 40-foot tall Christmas tree and a 3-metre tall Whisker dressed as a nutcracker in the delightful Nutcracker Christmas City; the nightly romantic Christmas Tree Lighting Ceremony; Santa’s Elf Secret Factory and Santa’s Christmas Hideaway for kids and families. A heart-warming Christmas filled with enchantment and excitement awaits guests of all ages.